USS Arizona Memorial and the battleship USS Missouri to its left. 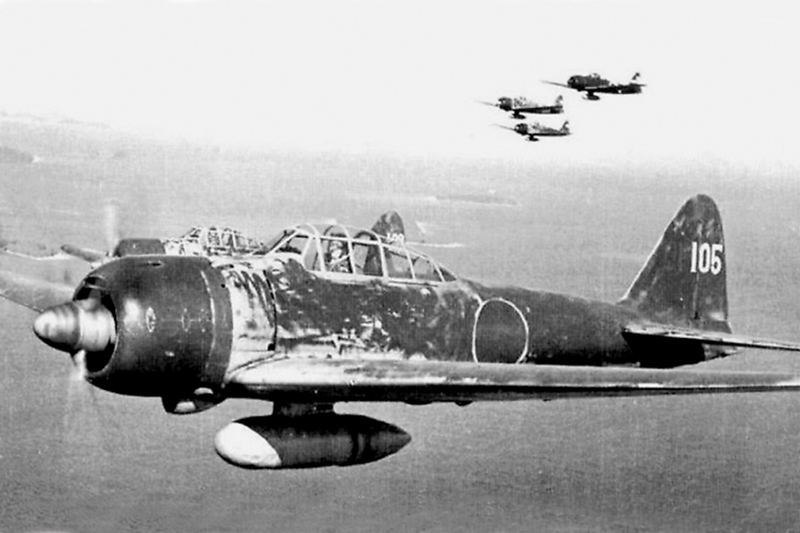 View from a Japanese plane at approximately 0800 on 7 December 1941. I was up on deck admiring the scenery and was pretty happy. Then in about three minutes I saw planes coming over and finally it dawned on me that those were Japanese planes, and they came very, very close to the Ramsay. They were lined up to torpedo the Utah. The Utah berth was one of their designated targets. 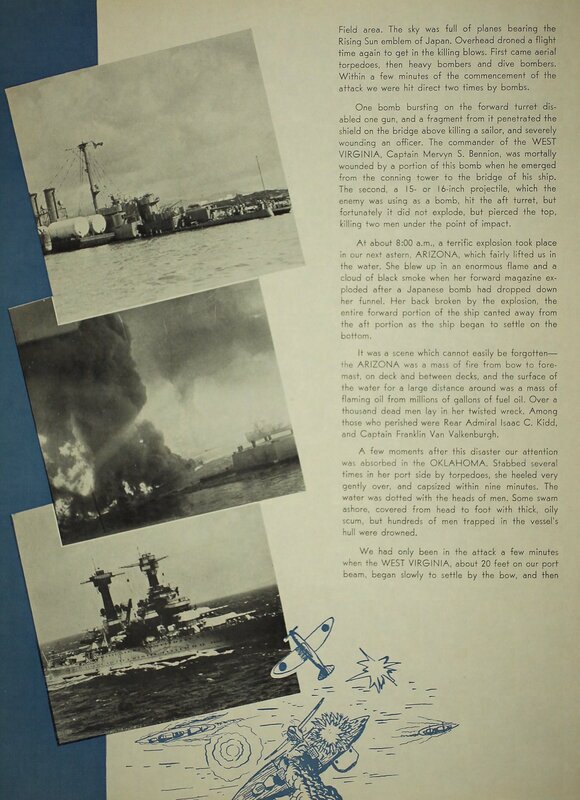 The planes were successful in getting several torpedoes into the Utah and we watched there dumbfounded just a short distance away to see the Utah battleship roll over in a matter of minutes after the first attack…We watched in amazement as she rolled over right in front of us with men falling off, because as the ship rolled it wasn’t buttoned up at all. They didn’t have time to close watertight doors. 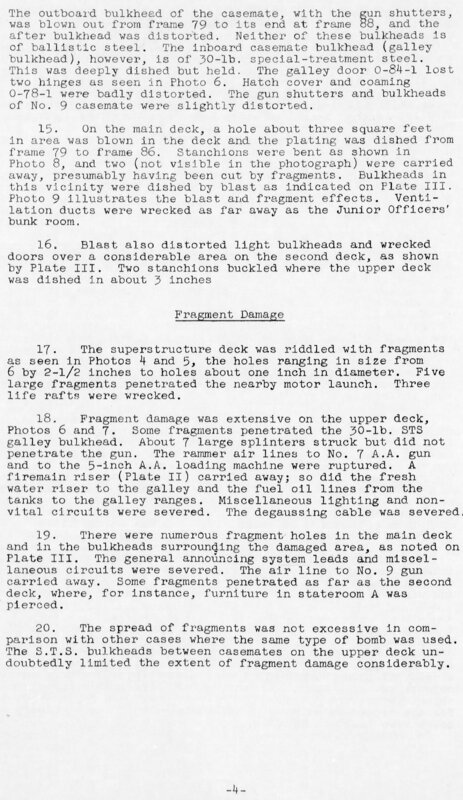 As it rolled the crew couldn’t stand up after a little while.They were coming off the ship and these timbers that had not been attached to the deck started rolling off when the men were coming off. 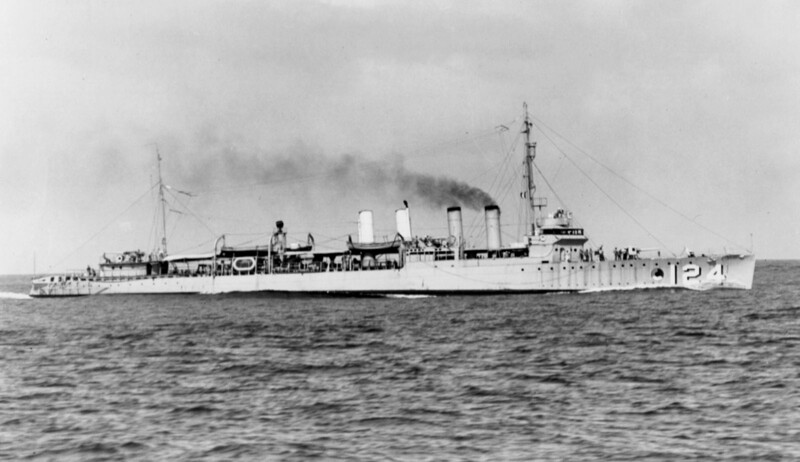 The Ramsay was one of the few ships to get underway. 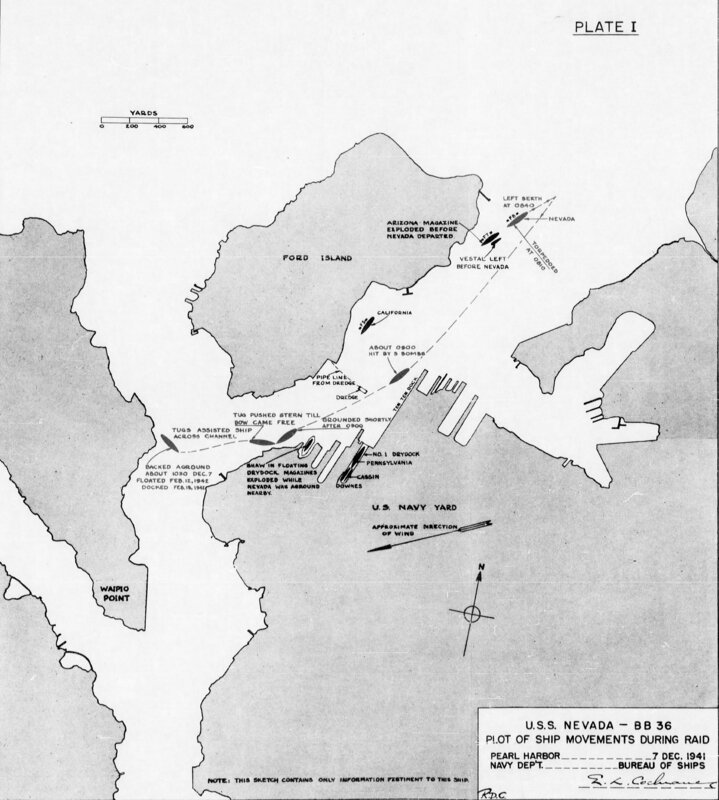 “We had the Ready Duty starting at 0800 which meant we had the steam up.” On their way out of the harbor, gunners of the Ramsay engaged enemy planes that were determined to not allow a single American ship to escape. 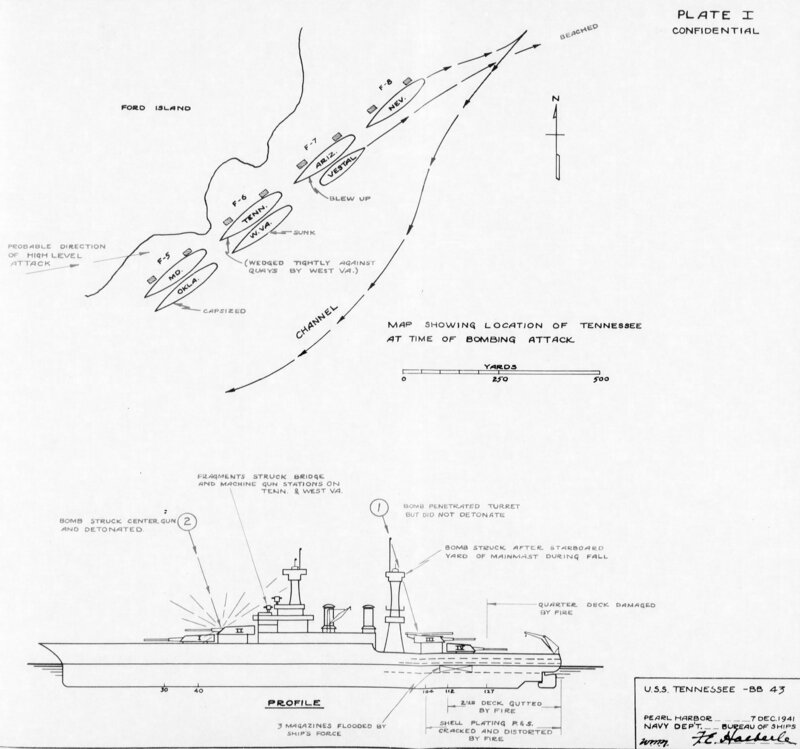 The Ramsay is credited with splashing at least one enemy plane. After she entered open water, Ramsay took up submarine patrol duty. 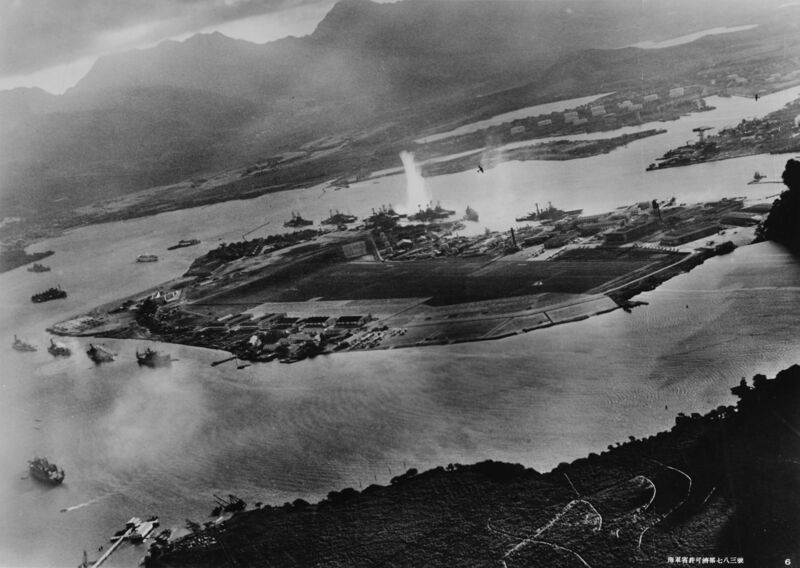 The attack inside Pearl Harbor continued. 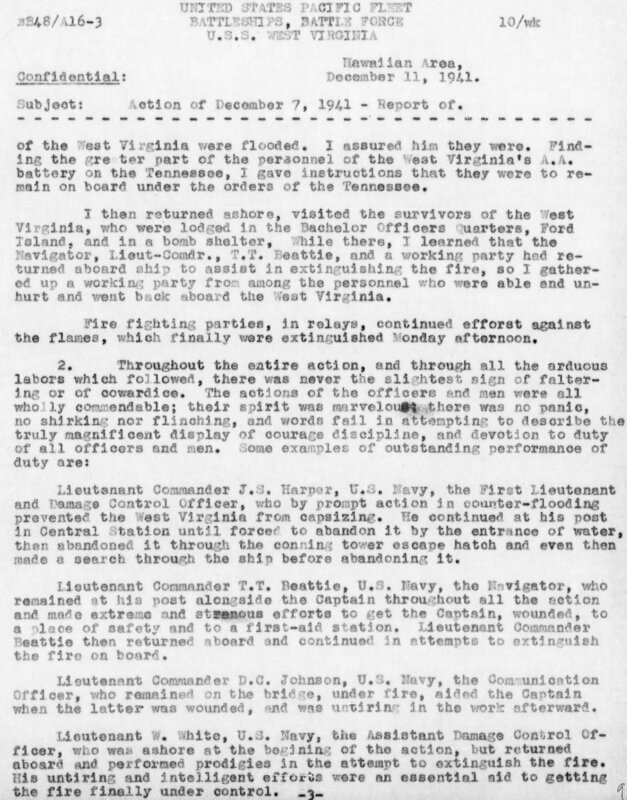 Gilbert Meyer was a Fireman First Class, promoted the night before the attack and serving aboard the Utah. Meyer was from Goose Creek, Texas and had joined the Navy at seventeen-years-old after dropping out of high school. On 6 December, he stayed up late in anticipation of mid-watch. 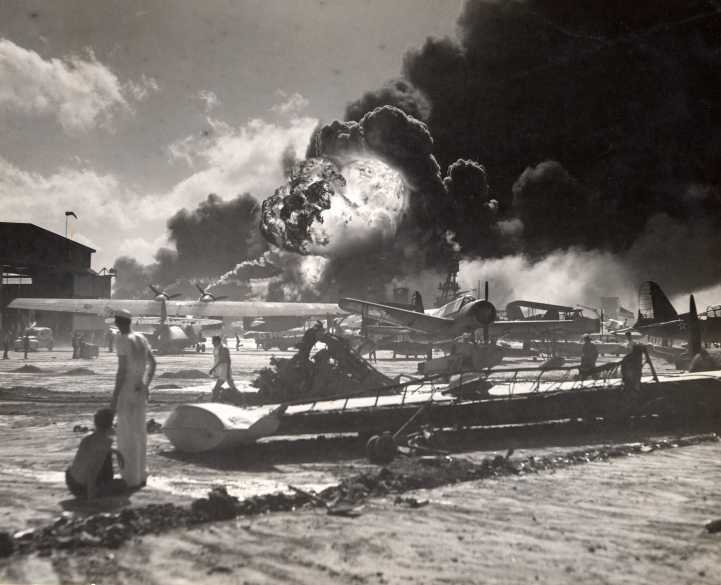 Before watch started, he and some fellow sailors debated the possibility of war with Japan. “We thought the war would be over in no time, if it ever started. So, we weren’t prepared at all.” When mid-watch was relieved, Meyer went down to his berthing compartment and went to sleep. He was sleeping on the starboard side of the ship. “I first woke up when the first torpedo hit and was so sleepy, I went back to sleep for just a few seconds. And shortly after that, the second one hit. When it hit, all the lights went out.” Meyer made for the side of the ship and jumped into the water with other survivors. After swimming to Fort Island, the survivors of the Utah could do nothing more than take cover in a trench and watch the growing devastation on Battleship Row. “It was a good place to watch the war from there,” Meyer said in an interview years later. J.C. Alston of Temple, Texas was assigned to gun turret two aboard the battleship USS California on the morning of the attack. Alston had the 0400-0800 watch. When his relief arrived, Alston headed to breakfast and “all hell broke loose.” Alston proceeded to his battle station until the order was given to abandon ship. The oil-covered water, which had caught fire, was like something out of hell. Alston and his shipmates jumped in anyway and swam to nearby Ford Island. 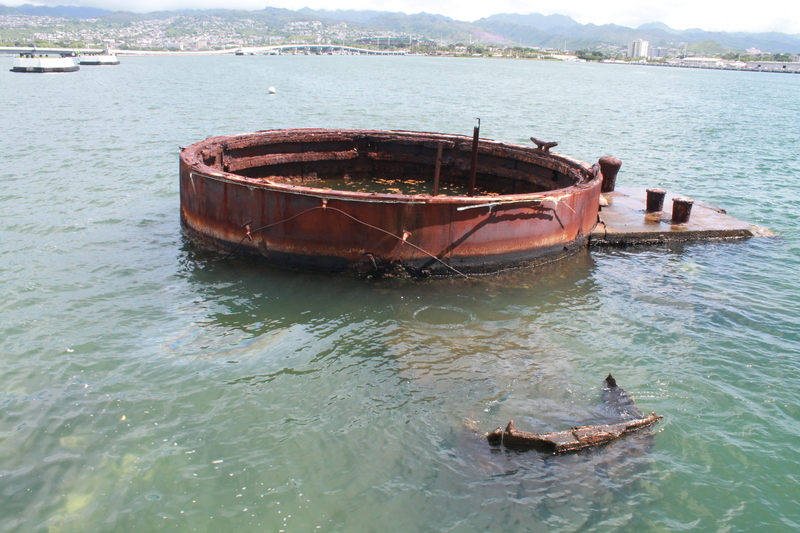 When the California’s gun turrets did not sink below water level, they were ordered to swim back to the ship and man the guns, which they did. Ray Kuhlow, also on the California, treated himself to watching the battle of the bands on Saturday night before the attack. He arrived back at his ship around midnight and went straight to bed. Kuhlow intended to perform his Sunday routine by sleeping late, eating breakfast and attending church on the fantail at 1000 hours. When the torpedo hit the California Kuhlow was awakened. 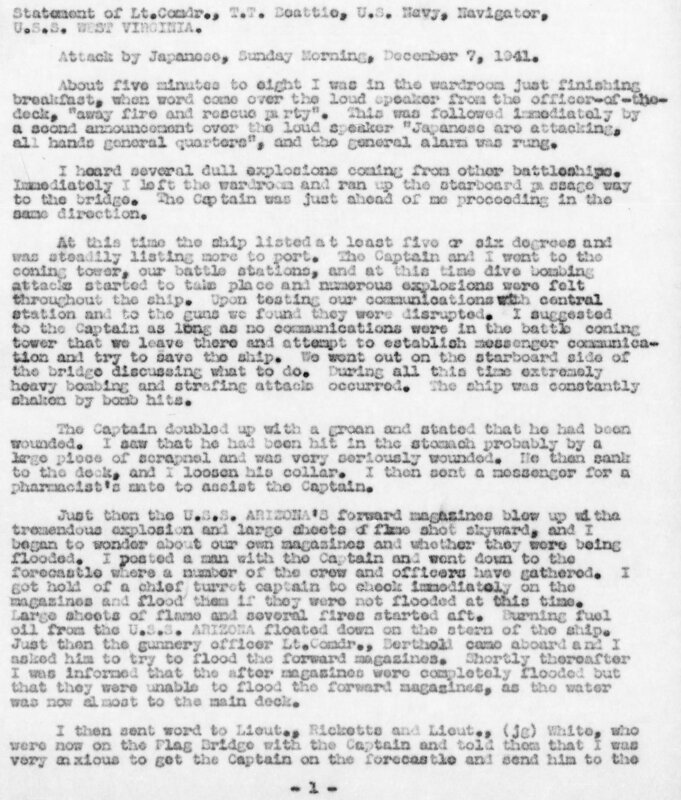 “I was startled by the shaking of the ship…About that time, they passed the word that we were being attacked by Japanese planes.”Kuhlow went to his battle station at turret two and soon realized that they were not going to fire those fourteen-inch guns at airplanes. “I was directed to take some men and go down below into an ammunition magazine and attempt to send some ammunition topside to our antiaircraft guns.” When the electric went out, Kuhlow and his five-man detail found themselves in total darkness. Water began to seep into the compartment where he was trapped through the air vents. As the California listed, Kudlow found it hard to stand up. The USS California settled on the bottom but her guns remained in action throughout the attack. They kept telling us over the telephone that they were working to get down to us, to get us out…I guess it was about twelve o’clock we were a little over belly-deep in water. 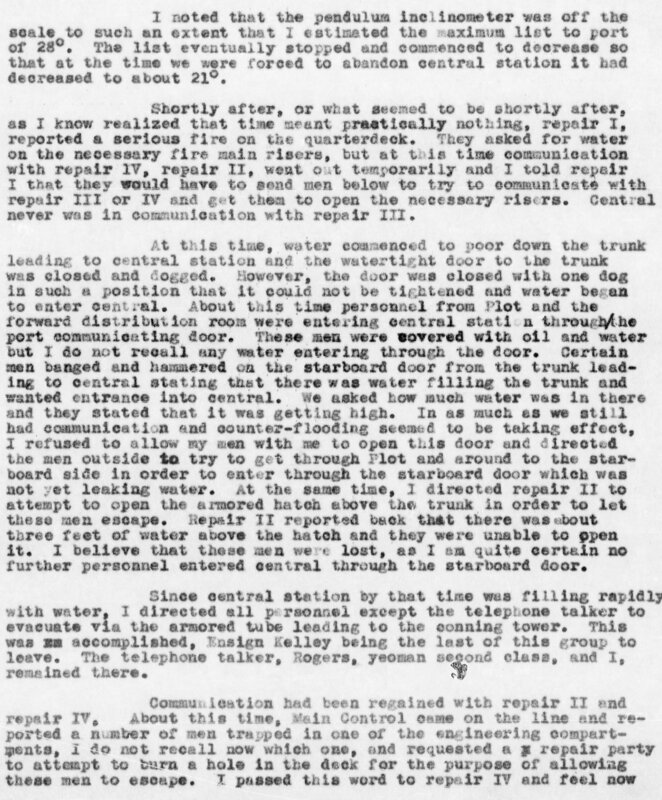 Word came that they had overcome the flooding…they figured another thirty or forty-five minutes they would get to us.” That time went by and then “there was a knocking on the other side of the hatch. A very welcome sound. 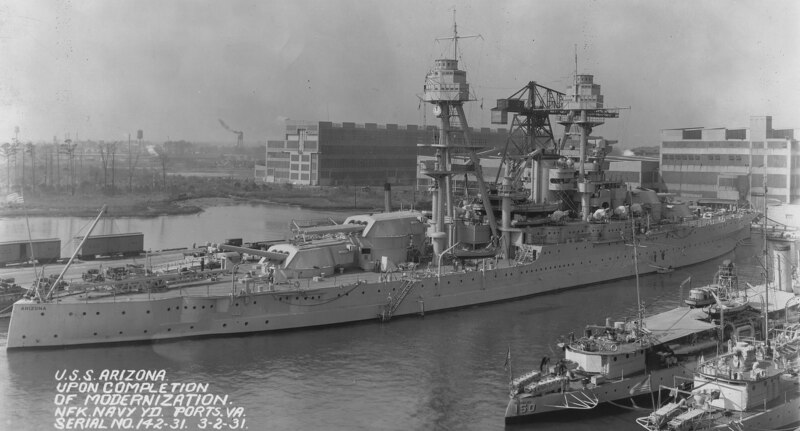 The USS Nevada was moored alone behind her sister battleships. When the attack started she was quick to get underway and headed for open water before being ordered to halt. 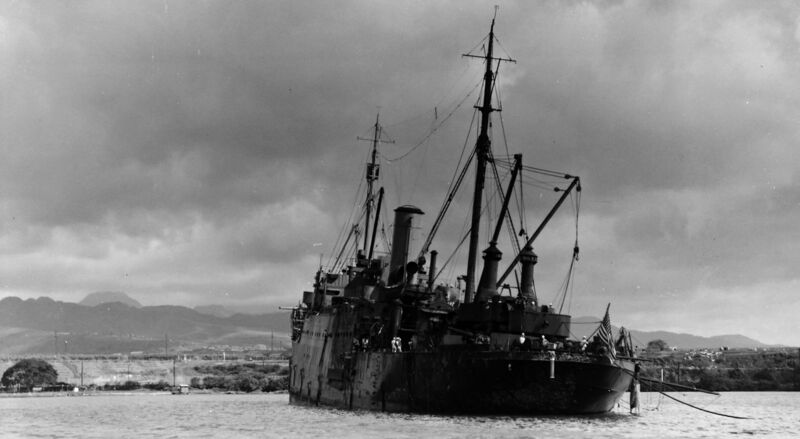 USS Nevada, intentionally grounded to prevent being sunk and blocking the harbor entrance. A Zero came over and gave us one spurt of 50 caliber. Every time he did it would knock a hole big enough that you could throw a ball through it in the PBY. I never knew why that Zero didn’t come back and finish us off because the PBY is like an old buzzard flying around. Euell White interview 6 December 2003, National Museum of the Pacific War, Fredericksburg, Texas. I guess it was probably the first bomb that was dropped, me and buddy were getting ready to go on liberty and I looked out the window and about that time this plane came over with a big red ball on it…It was rather funny, we had this young bugle boy, and he did not know the Call of Arms, so he blew Fire Call. At least we all got out of the barracks. Where I was at, it sloped right down to Battleship row, and I saw all of them hit the bottom. 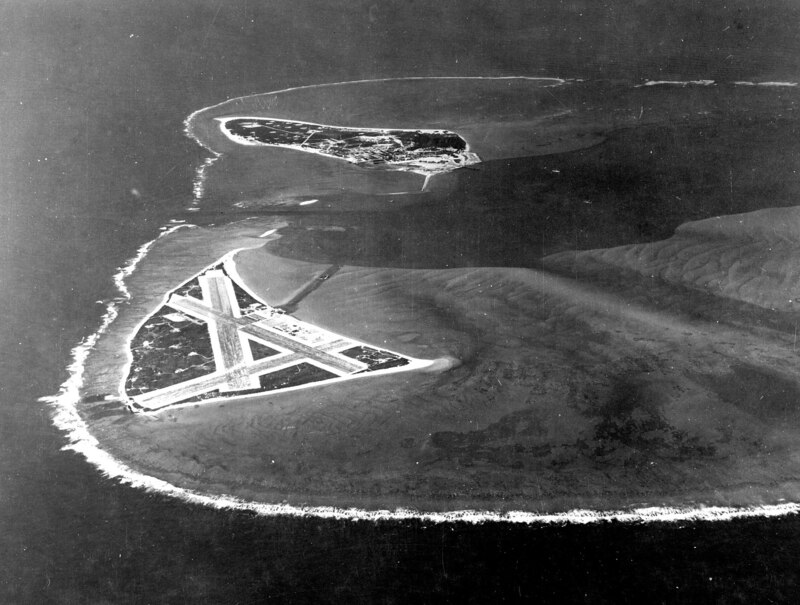 Marines fought all across the Pacific from Wake Island to Oahu during the initial Japanese attacks, which resulted in the United States’ entry into WWII. Each ship present at Pearl that Sunday morning had at least a small detachment of marines. They stood beside their brother sailors and performed bravely. The President of the United States of America takes pleasure in presenting the Navy Cross to Corporal Joseph R. Driskell (MCSN: 283270), United States Marine Corps, for exceptional courage, presence of mind, and devotion to duty and disregard for his personal condition while serving on board the U.S.S. 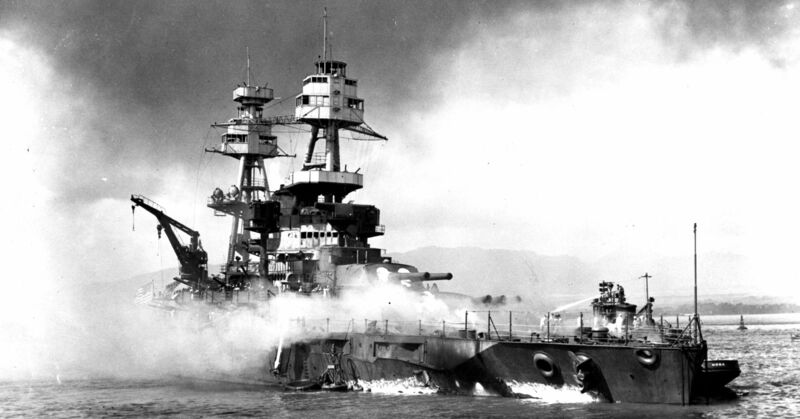 NEVADA (BB-36) during the Japanese attack on the United States Pacific Fleet in Pearl Harbor, Territory of Hawaii, on 7 December 1941. Corporal Driskell, the gun captain of No. 9 broadside gun of the U.S.S. NEVADA, was seriously wounded and burned, and most of his clothing burned off when a bomb exploded in the immediate vicinity of his gun. Disregarding his condition, he insisted on manning another gun after his own was wrecked. Despite serious leg wounds, he refused to join the wounded, but assisted other wounded men instead, and then joined fire-fighting squads which contributed materially to bringing the fires under control. His outstanding courage, aggressive fighting spirit and devotion to duty reflect the highest credit upon Sergeant Hailey and the United States Naval Service. 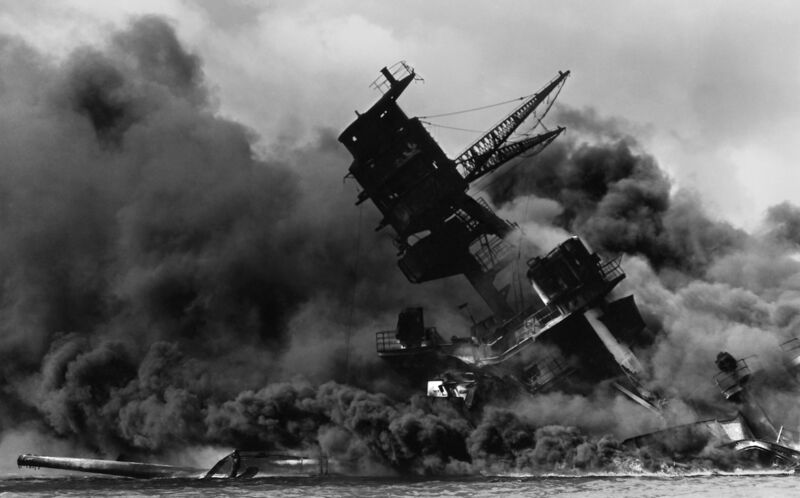 No ship present at Pearl Harbor on 7 December denotes the Day of Infamy more so than does the USS Arizona. 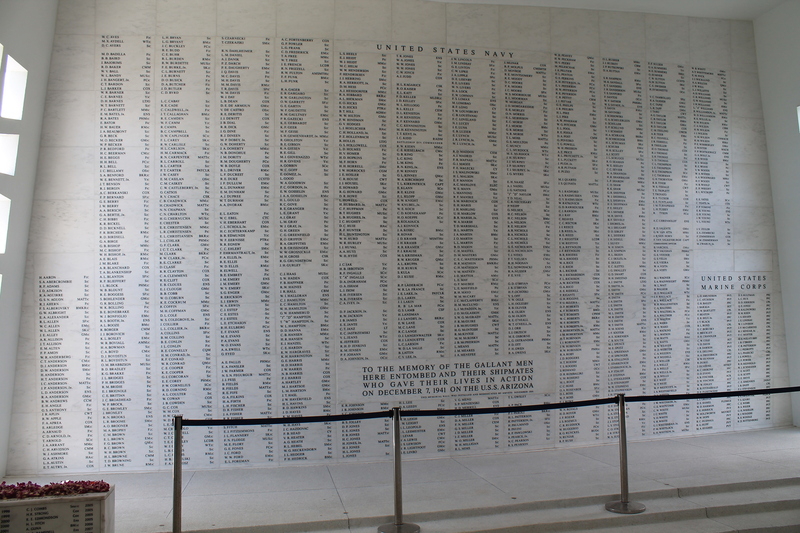 The Arizona, through its modern-day memorial, has come to symbolize the disaster at Pearl Harbor and why we fought. Stratton was in the director of his gun which provided meager protection. “We got caught in that ball of fire with no place to go. 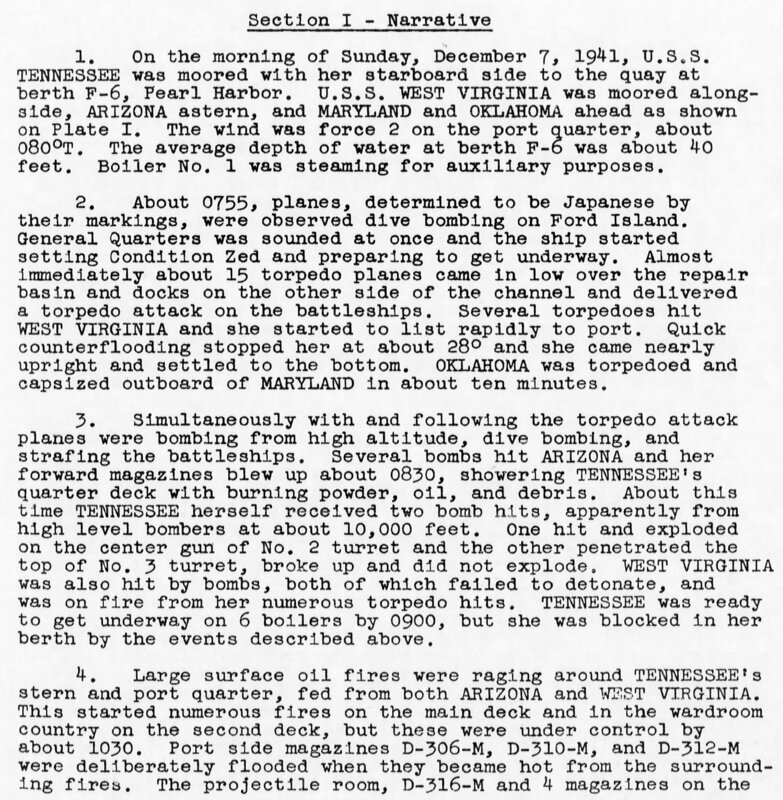 It seemed like forever, but finally the flames died down…The deck was so hot we couldn’t hardly walk on it.” Stratton and his gun crew got the attention of a sailor on the deck of the USS Vestal (AR-4). He immediately threw across a heaving line and Stratton and the other survivors crossed the line hand-over-hand for more than sixty feet to reach the safety of the Vestal. The man who threw the line was Petty Officer Second Class Joe George. The Vestal was preparing to make her escape and was warming up her engines to get underway. Stratton and the Arizona men were badly burned but alive. They were taken by boat to shore and then transferred to the hospital before the Vestal departed. They would be among the small number of Arizona survivors. 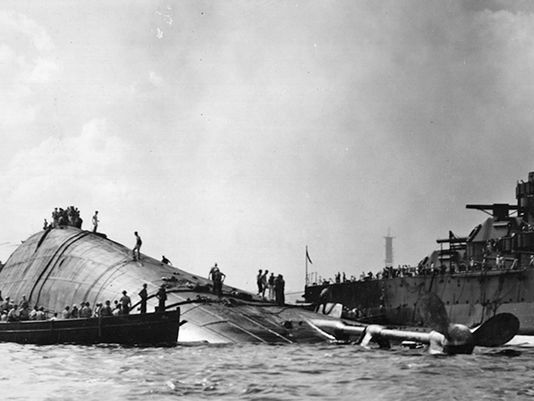 Badly damaged, the Vestal was grounded on Aiea Bay shortly after the attack ended. No ships at Pearl that day went undamaged. 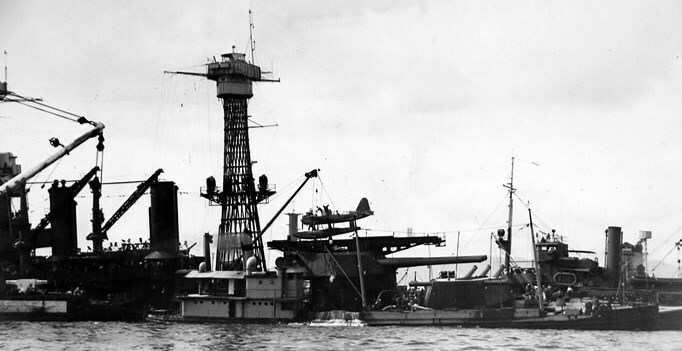 Although in drydock at Pearl Harbor Navy Yard, Pennsylvania (BB-38) was one of the first ships to get her guns armed and firing on the enemy planes. 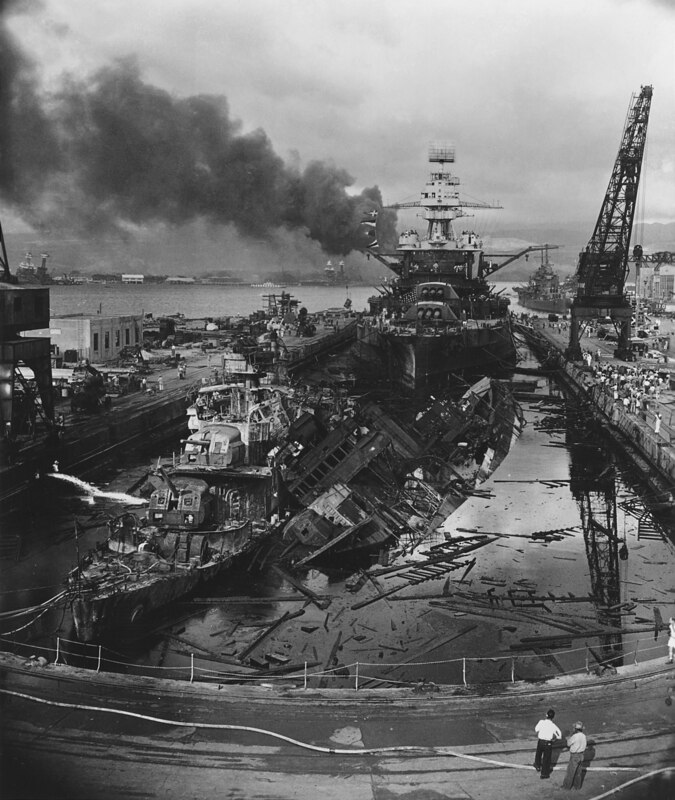 The Cassin, Downes and Pennsylvania where in drydock under going repairs before the Japanese attack of 7 December. The USS Tennessee was tied alongside the West Virginia. Directly in front of them was the Maryland and outboard to her was the Oklahoma. Sixty feet astern of the Tennessee was the Arizona. Quartermaster Thomas Butler was from Oneida, Tennessee. 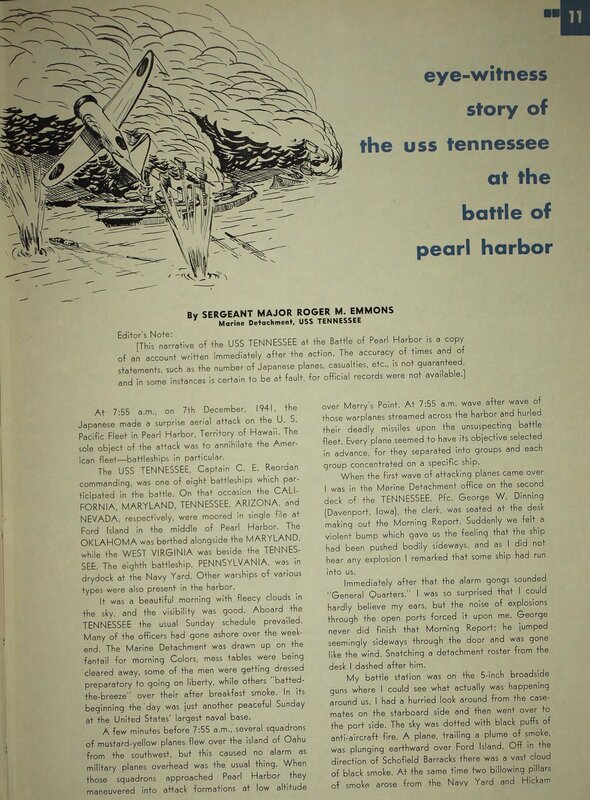 He enlisted in the Navy in 1938 and was assigned to the Tennessee after basic training. Butler was asleep on the bridge of the ship early on Sunday morning. There was no air conditioning below and since his cleaning and working station was on the bridge he slept there to avoid the heat and stale air below. Butler explained in a later interview that most of the sailors bought canvas cots, “we called them army cots at that time…it was much more comfortable. Cooler and on Sunday morning you weren’t bothered by the master at arms. 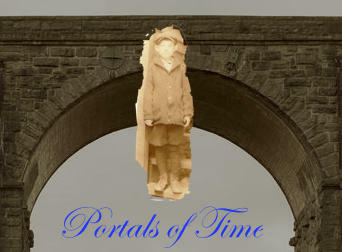 You weren’t bothered by reveille up there.” That morning Butler was still asleep when he was awakened by the sounds of “explosions.” I thought, “one of our planes has crashed.” Butler put on his short white trousers and went out to the front of the bridge to see what was happening. “I could see smoke and flames over on Ford Island,” where he had initially thought a plane must have crashed. 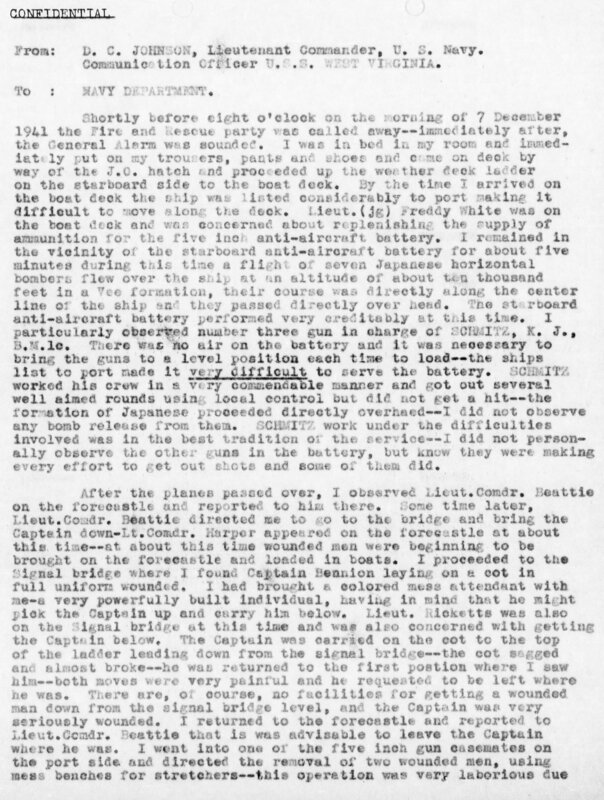 “Then I heard some planes approaching from our port side…I looked over there and this was a flight of Japanese planes.” Butler did not know they were Japanese at first, but when, “I saw one dip his wings and drop a torpedo” he knew. 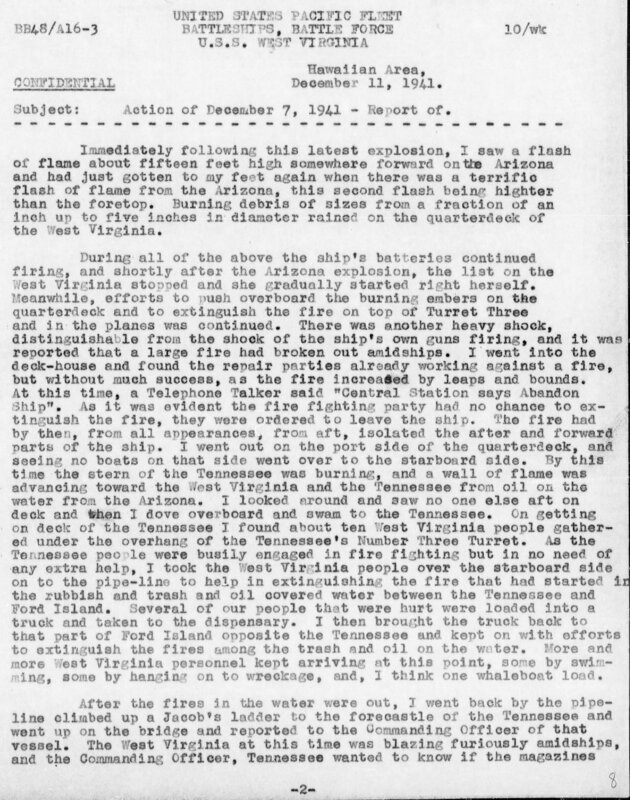 “I sit there watched fascinated this torpedo come through the water and hit the West Virginia.” Butler watched the scene play out. There was a sailor on the bow of the West Virginia that was at that moment going up to hoist the Union Jack. 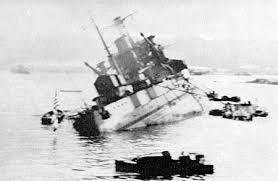 The torpedo hit and Butler watched as the sailor was thrown up into the air and was then gone. The same flight of planes dropped two torpedoes that hit the Oklahoma. Butler watched it all from his bridge perch. “I saw these planes come over close enough that I could see the pilot inside of it. He had his canopy pulled back and he was sitting there laughing.” Butler’s duty assignment was in central steering station. General quarters had not sounded when Butler left the bridge for his station. He would always regret that there was a general quarters alarm near him on the bridge and he did not pull it. Had he sounded the alarm earlier, it might have given the crew more time to get into action. 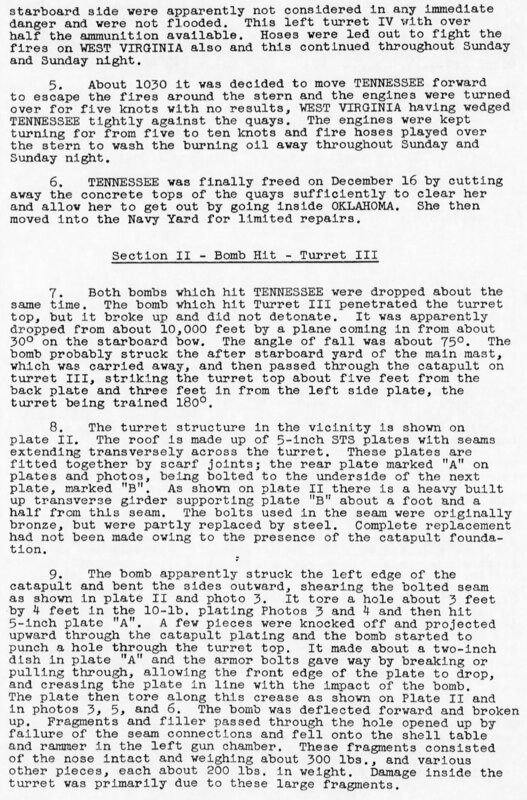 Before he could get to his station, a bomb hit the center gun, number two turret, and exploded. Butler also saw the Oklahoma start to roll over. Once Butler arrived at his station he was ordered to aft steering. There, a man could manually steer the ship in an emergency. 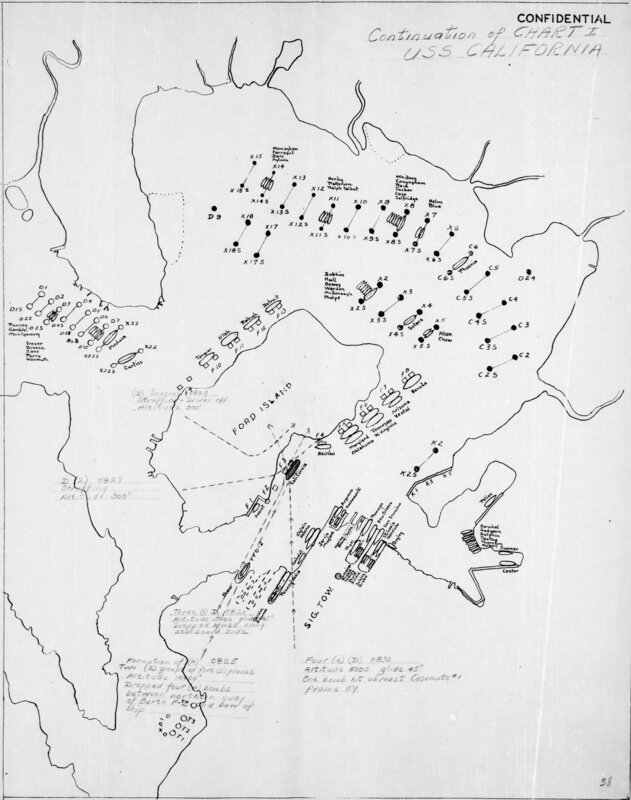 Although, the Tennessee was wedged in by her sister ships and there was no way she could have gotten underway. 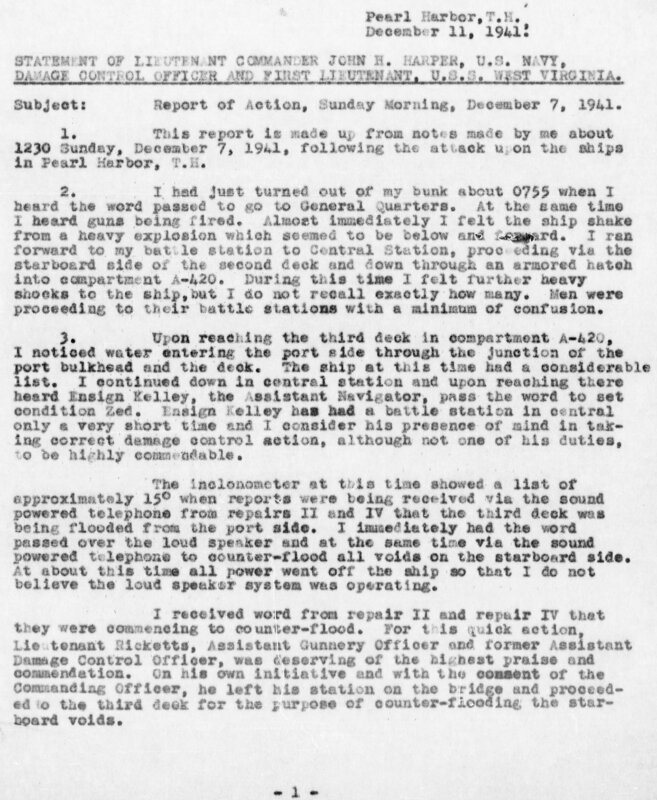 By that time, general quarters had sounded and all the watertight hatches were being closed. Because he had to open and then close the hatches, it took Butler almost twenty minutes to reach the aft steering compartment. Butler, an electrician and a machinist mate were locked into the aft steering section. Butler’s two companions had not been topside and it was left to him to break the news the United States was at war with Japan. Water began to seep in through the armed hatch. 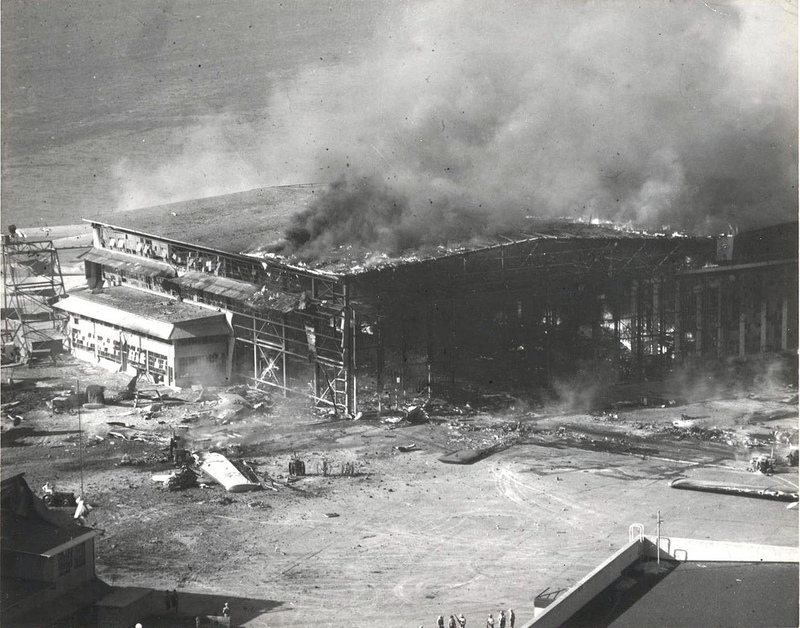 They had previously had phone contact with the bridge and knew another flight of bombers was attacking. It was about 0900. “The bulkhead was so hot, you couldn’t put your hand against it. 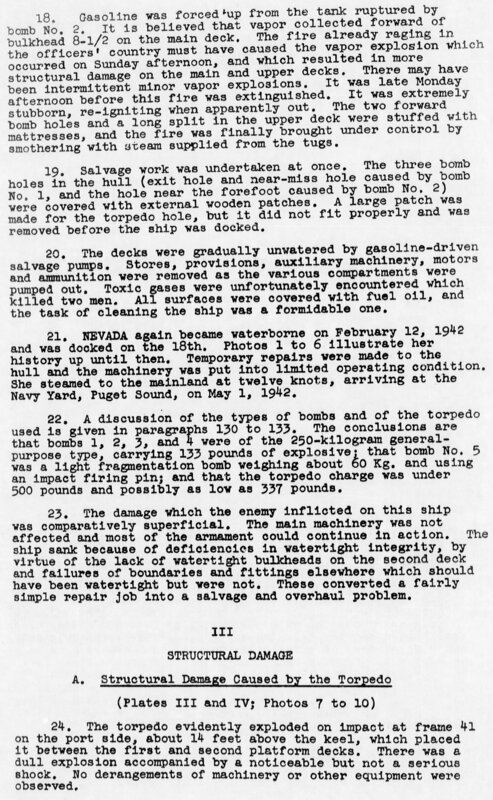 So, we didn’t know if we were sunk.” Damage control personnel opened the armed hatch and let them out around noon. 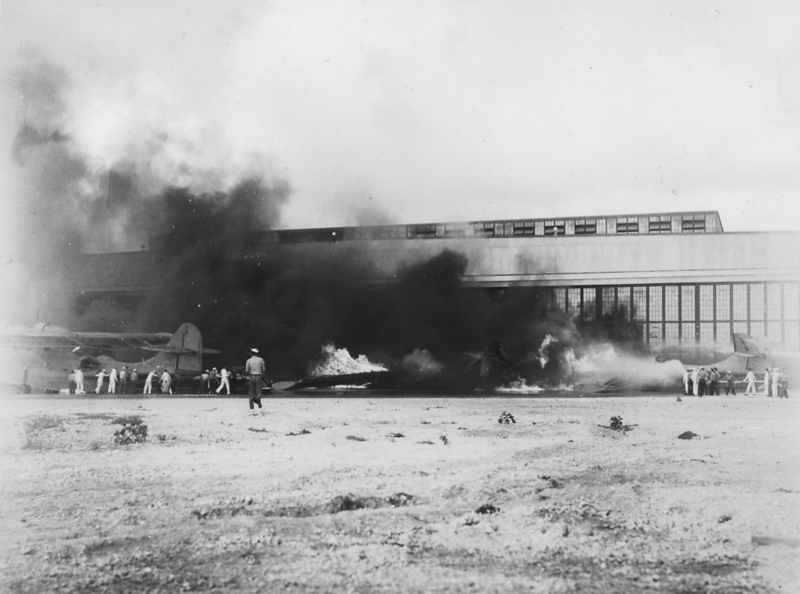 When they did, Butler found out that the extreme heat on the bulkheads in the aft sections was produced by the Arizona’s burning. 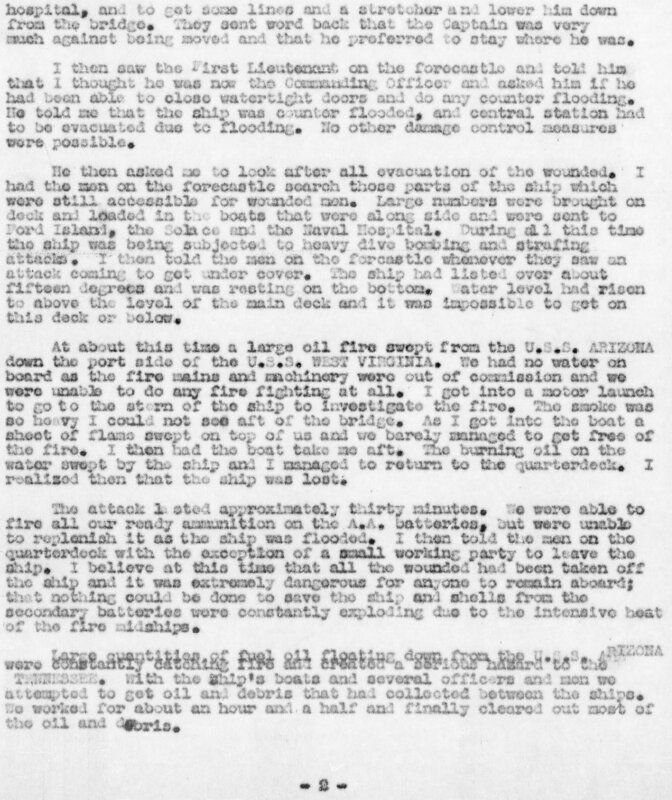 The water coming in had been from the firehoses and men of his own ship fighting fires in the officers’ quarters directly above them. We were looking up in the sky and there were bombs. There were planes flying down… and we assumed that they were doing target practice… we couldn’t understand why are they doing this on a Sunday? That’s the first time. And then in port. I mean, we didn’t realize and we discussed this among ourselves, which in the few seconds that we had. And then, across the bay, we seen a ship afire, smoking. So, the officer of the day was on the quarterdeck also, and he had the bugler sound fire and rescue. You tried everything when you’re in this position, you’re not going to say, ‘Hey, that’s not an anti-aircraft gun,’ so they fired what they — you would throw rocks. If you had rocks, we would throw rocks at ‘em. We were down lower, as we had already hit the bottom, and the fellows from the Tennessee, they had, as you know, they have what they call these here big ropes, they call ‘em bumpers, in between to kind of keep the ships from hitting each other. And so, oil was already spreading out from the [tanks]. Then, there was oil on the ship, and I can see a – I never could [climb] that hawser in school, that you would climb up in a gym? But that day, this was oily, so I climbed that up, even with the oil. And you know how hard you gotta grip. That’s just like trying to hold onto a greased pig. So, you can see what you can do when there’s anxiety, or when they’re fright[ened], or when there’s anger, danger, whatever you want to call it… they were firing away, from up above, or wherever it was coming from, they were dropping the cans down below, and I can see those cans hitting some of the fellows on the head, on the shoulder. Hey, the fellows would go down, never seen ‘em come up anymore. I hid under with some of the other fellows, under turret number two. That was a sixteen-inch gun and Jap planes came by and you can just see the bullets, you know, going. I guess they were two by two. And as they hit the teakwood, they would just splinter it… Probably the same way as you’ve seen done in the movies. 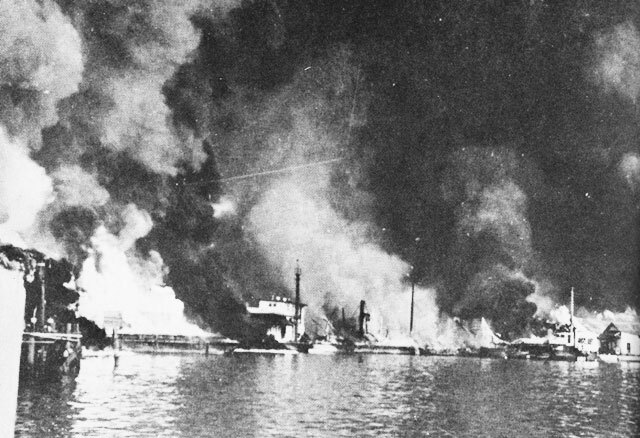 West Virginia burns in the background as a boat rescues a man from the water. You can just see the fellow’s face, ‘Hey, help me.’ It’s a look. I don’t know just how to explain it, but it’s a look. ‘Hey, look, save me,’ and this fellow says no and he was in charge of the whaleboat, and he can just go back. He had his reasons, why I don’t know. But I couldn’t throw him that line there… Well, from that, as I say, fright, fright and that fright. And it was, you kind of forget about yourself and then, you do this, and then from there it was anger. I was going back down to my sleeping quarters, and on the way down, of course, I went by the PX. I was looking in the through the window. I’m looking for something to buy my mother and sisters. Presents for Christmas. And then, while I’m standing there, I heard this thump. Didn’t think much of it and then, a few seconds later, another thump. Of course, these were two torpedoes hitting the ship. And, then shortly after that, general quarters was announced. I was caught in the number seven secondary gun compartment as the ship capsized. And the water started whirling around. I was about to give up, I had swallowed so much water. 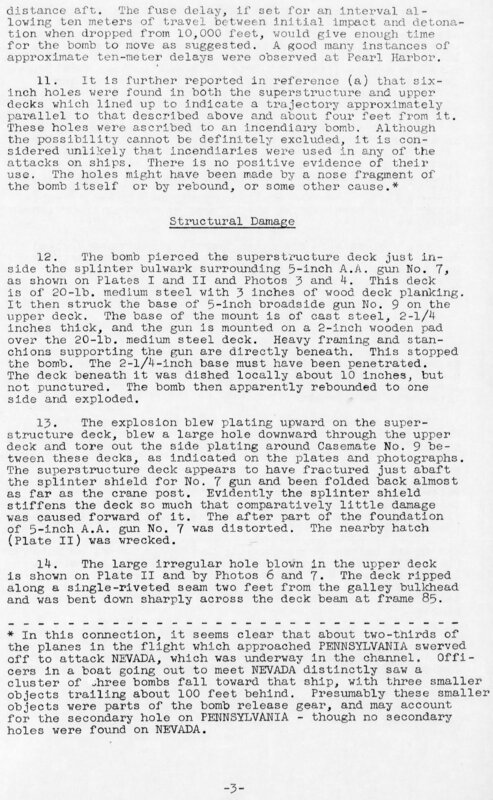 We came up then into an air pocket that was formed by the deck and the bulkhead… Then, after the ship had settled down, I could feel the breech of the secondary gun, so, of course, the secondary gun extended out past the catwalk: there were about four of us caught in the compartment. And, I said, well, I think we got away out of here so I just followed the barrel of the gun past the catwalk and popped out to the surface. And, of course, I swam there for a while, and a navy launch came by and picked us up, and they told us to go to the administration building. Joseph C. Spitler was born in Lufkin, Texas. He graduated from the Naval Academy in 1941. 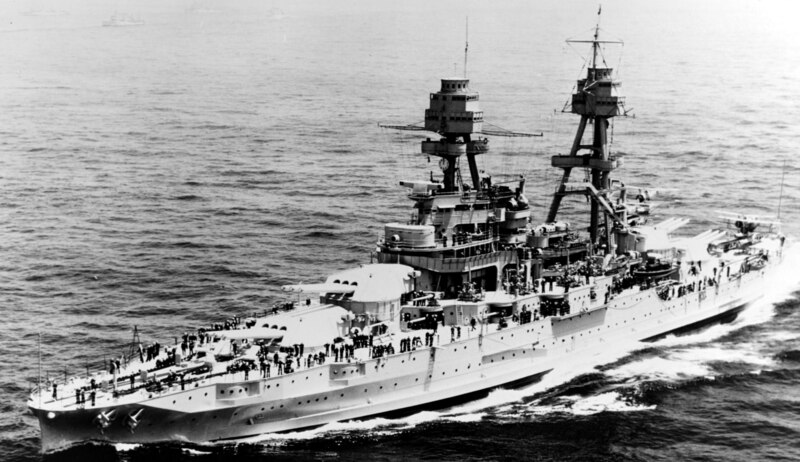 He was then assigned to the USS Oklahoma. I had the four to eight watch, the morning of December 7, along with Bill Ingram (Class of’38)–the famous football player. We were relieved at a quarter of eight. I went to do what one would normally do after being on his feet and drinking all of that coffee. I went by my stateroom, took my white jacket off and hung it up and put my wallet on the desk. Then I went up to the head and that’s where I was when I got the word that the Japs were bombing Ford Island. My normal station was in the handling room, so I started running aft after hearing about the attack. As I went through the junior officers’ quarters, they were calling ‘GeneralQuarters. Man your battle stations.’ Being Sunday morning, there were a lot of junior officers up there still asleep. By the time I ran about half or maybe a third the length of the ship, the torpedoes started hitting the Oklahoma. They were hitting in the forward part because that was the only part of the ship that was exposed to the channel the torpedoes had to be launched in. I’m sure that caused a lot of the casualties in the junior officers’ quarters. When I got to the lower handling room, I was told that there was no turret officer because he was the officer of the deck. I went up to the turret officers booth, but by the time I got up there the word was passed, ‘Abandon Ship.’ The ship was already starting to list. We got out through the overhang of the turret. A total of 15 sailors earned the the nation’s highest thanks and were awarded the Medal of Honor for their actions during the surprise attack on Pearl Harbor and the island of Oahu. For The President of the United States of America, in the name of Congress, takes pride in presenting the Medal of Honor (Posthumously) to Ensign Francis Charles Flaherty, United States Naval Reserve, for conspicuous devotion to duty and extraordinary courage and complete disregard of his own life, above and beyond the call of duty, during the attack on the Fleet in Pearl Harbor, Territory of Hawaii, by Japanese forces on 7 December 1941. When it was seen that the U.S.S. OKLAHOMA (BB-37) was going to capsize and the order was given to abandon ship, Ensign Flaherty remained in a turret, holding a flashlight so the remainder of the turret crew could see to escape, thereby sacrificing his own life. For The President of the United States of America, in the name of Congress, takes pride in presenting the Medal of Honor (Posthumously) to Chief Boatswain Edwin Joseph Hill, United States Navy, for distinguished conduct in the line of his profession, extraordinary courage, and disregard of his own safety during the attack on the Fleet in Pearl Harbor, Territory of Hawaii, by Japanese forces on 7 December 1941. 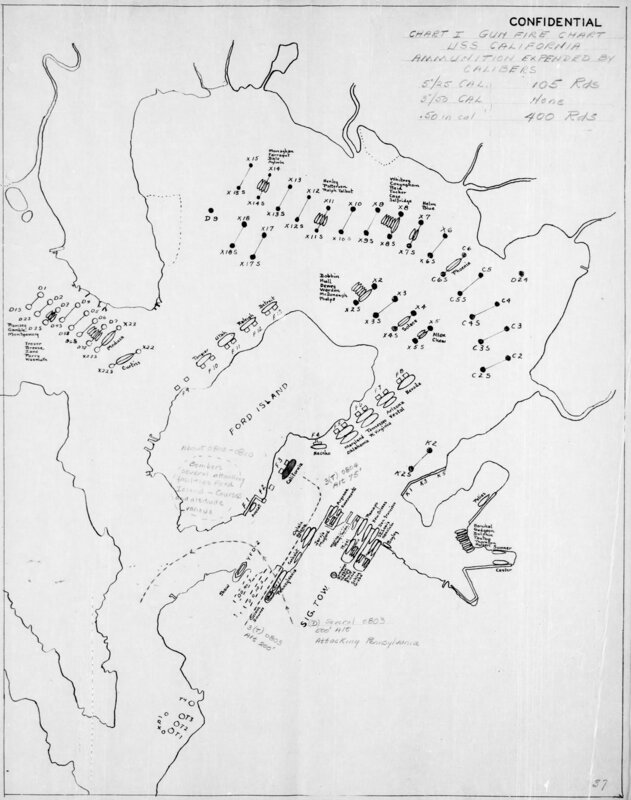 During the height of the strafing and bombing, Chief Boatswain Hill led his men of the line-handling details of the U.S.S. 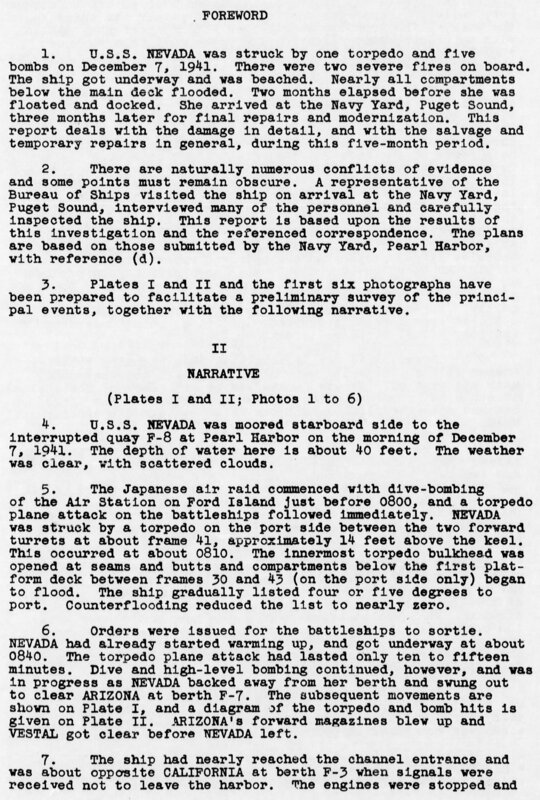 NEVADA (BB-36) to the quays, cast off the lines and swam back to his ship. Later, while on the forecastle, attempting to let go the anchors, he was blown overboard and killed by the explosion of several bombs. 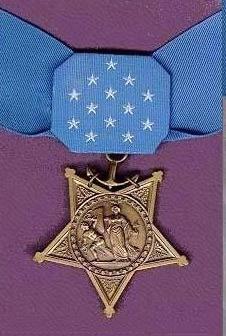 For The President of the United States of America, in the name of Congress, takes pleasure in presenting the Medal of Honor to Warrant Machinist Donald Kirby Ross, United States Navy, for distinguished conduct in the line of his profession, extraordinary courage and disregard of his own life during the attack on the Fleet in Pearl Harbor, Territory of Hawaii, by Japanese forces on 7 December 1941. When his station in the forward dynamo room of the U.S.S. 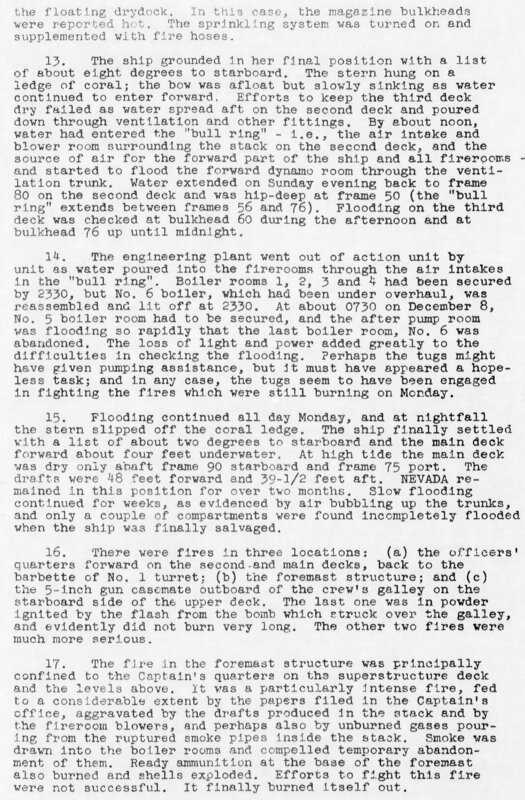 NEVADA (BB-36) became almost untenable due to smoke, steam, and heat, Warrant Machinist Ross forced his men to leave that station and performed all the duties himself until blinded and unconscious. Upon being rescued and resuscitated, he returned and secured the forward dynamo room and proceeded to the after dynamo room where he was later again rendered unconscious by exhaustion. Again recovering consciousness he returned to his station where he remained until directed to abandon it. For extraordinary heroism distinguished service, and devotion above and beyond the call of duty. During the first attack by Japanese airplanes on the Naval Air Station, Kaneohe Bay, on 7 December 1941, Lt. [John W.] Finn promptly secured and manned a .50-caliber machinegun mounted on an instruction stand in a completely exposed section of the parking ramp, which was under heavy enemy machinegun strafing fire. Although painfully wounded many times, he continued to man this gun and to return the enemy’s fire vigorously and with telling effect throughout the enemy strafing and bombing attacks and with complete disregard for his own personal safety. It was only by specific orders that he was persuaded to leave his post to seek medical attention. Following first aid treatment, although obviously suffering much pain and moving with great difficulty, he returned to the squadron area and actively supervised the rearming of returning planes. His extraordinary heroism and conduct in this action were in keeping with the highest traditions of the U.S. Naval Service. 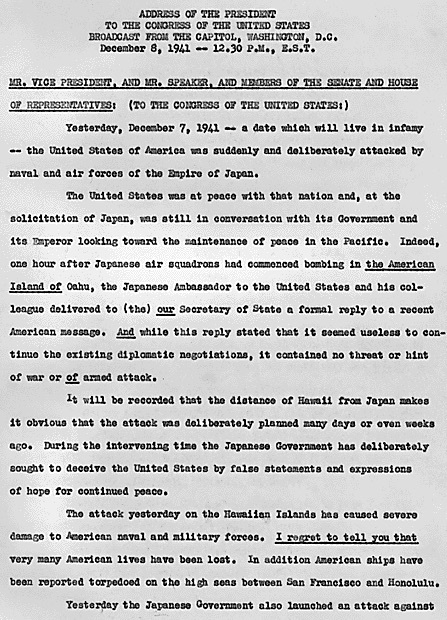 For The President of the United States of America, in the name of Congress, takes pleasure in presenting the Medal of Honor to Captain Samuel Glenn Fuqua, United States Navy, for distinguished conduct in action, outstanding heroism, and utter disregard of his own safety above and beyond the call of duty during the attack on the Fleet in Pearl Harbor, Territory of Hawaii, by Japanese forces on 7 December 1941. Upon the commencement of the attack, Lieutenant Commander Fuqua rushed to the quarterdeck of the U.S.S. 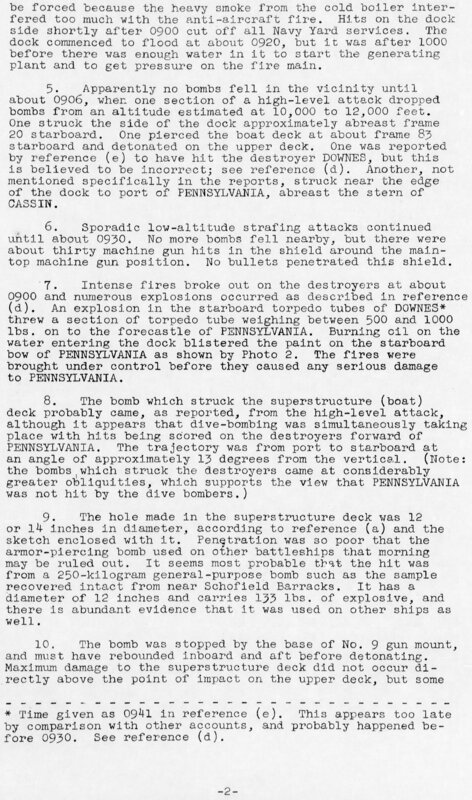 ARIZONA (BB-39) to which he was attached where he was stunned and knocked down by the explosion of a large bomb which hit the guarterdeck, penetrated several decks, and started a severe fire. Upon regaining consciousness, he began to direct the fighting of the fire and the rescue of wounded and injured personnel. Almost immediately there was a tremendous explosion forward, which made the ship appear to rise out of the water, shudder, and settle down by the bow rapidly. The whole forward part of the ship was enveloped in flames which were spreading rapidly, and wounded and burned men were pouring out of the ship to the quarterdeck. 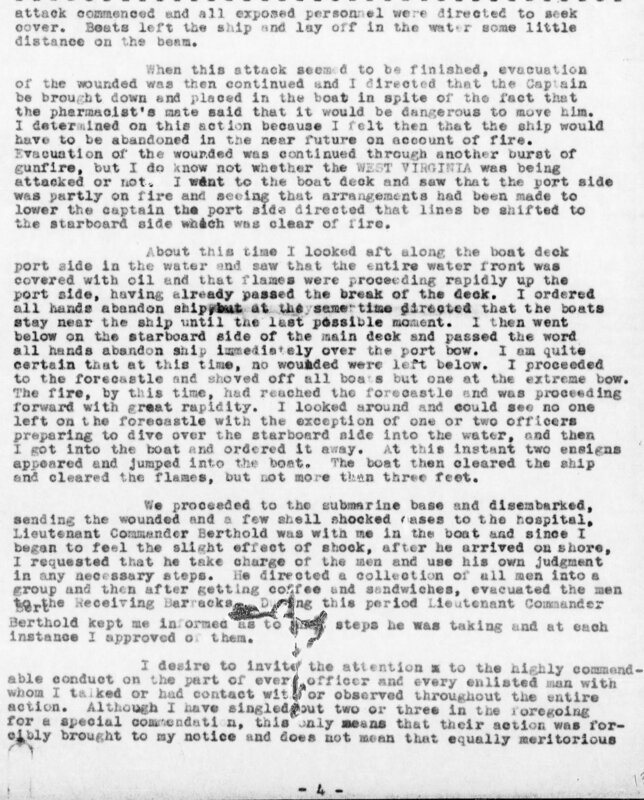 Despite these conditions, his harrowing experience, and severe enemy bombing and strafing, at the time, Lieutenant Commander Fuqua continued to direct the fighting of fires in order to check them while the wounded and burned could be taken from the ship and supervised the rescue of these men in such an amazingly calm and cool manner and with such excellent judgment that it inspired everyone who saw him and undoubtedly resulted in the saving of many lives. 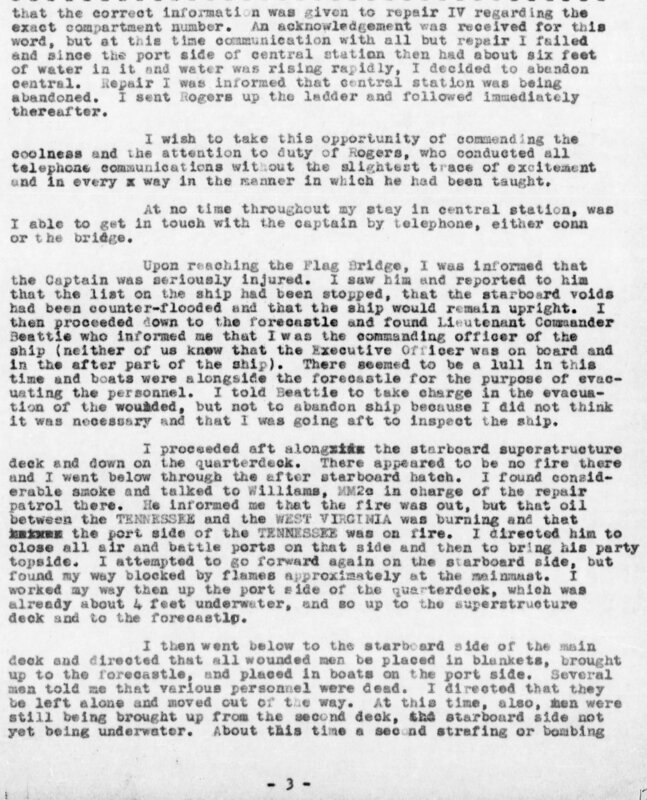 After realizing the ship could not be saved and that he was the senior surviving officer aboard, he directed it to be abandoned, but continued to remain on the quarterdeck and directed abandoning ship and rescue of personnel until satisfied that all personnel that could be had been saved, after which he left his ship with the boatload. The conduct of Lieutenant Commander Fuqua was not only in keeping with the highest traditions of the naval service but characterizes him as an outstanding leader of men. 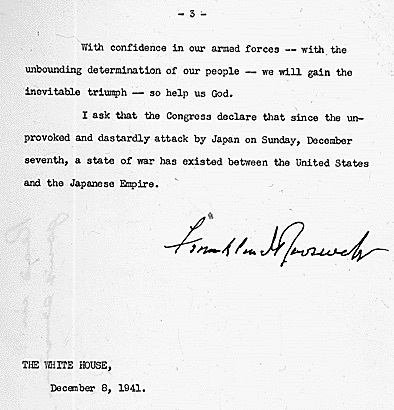 With the tragic loss of life and ship at Pearl Harbor, it is often easy to forget that the forces of Imperial Japan struck across the length of the Pacific on 7 December 1941. 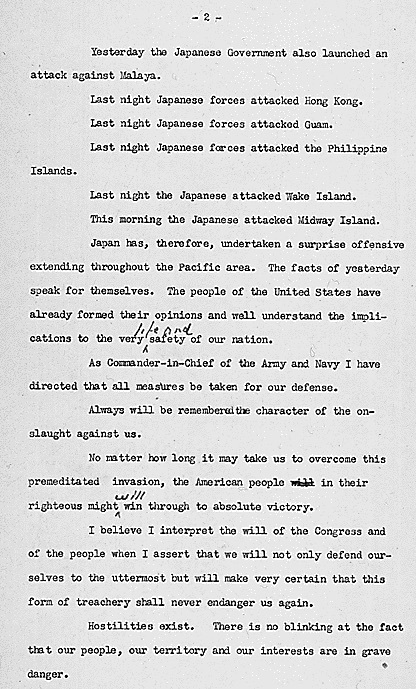 On Midway, Wake, Guam, the Philippines, and many others, members of the United States armed forces and their allies held their ground and set an example of courage that would be followed by their brothers and sisters until the last remnant of Japanese resistance was extinguished. Lt. Cannon was the only marine to receive the Medal of Honor on that day. 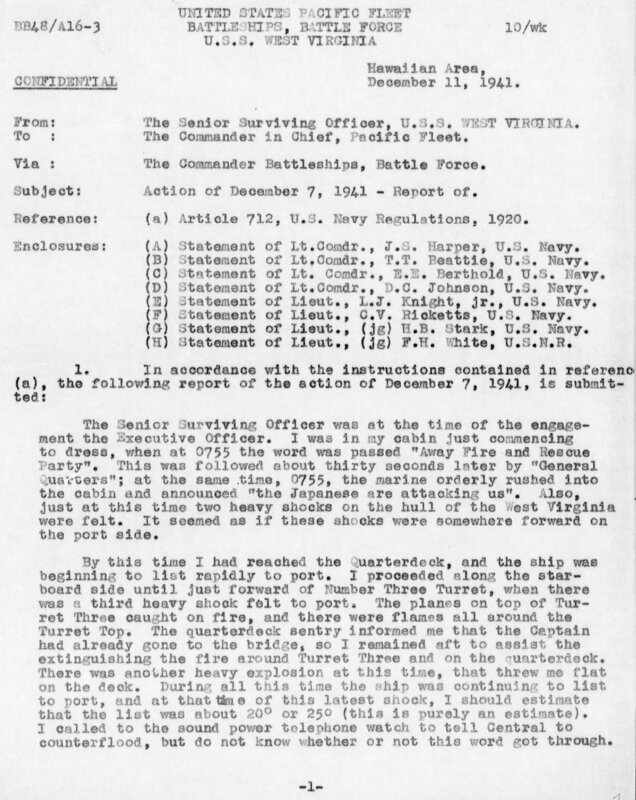 For distinguished conduct in the line of his profession, extraordinary courage and disregard of his own condition during the bombardment of Sand Island, Midway Islands, by Japanese forces on 7 December 1941. 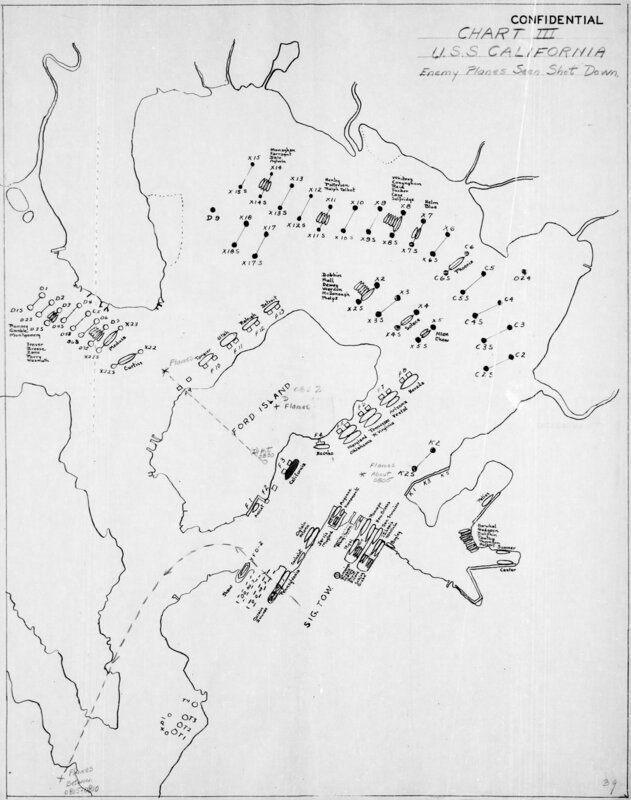 1st Lt. [George Ham] Cannon, Battery Commander of Battery H, 6th Defense Battalion, Fleet Marine Force, U.S. Marine Corps, was at his command post when he was mortally wounded by enemy shellfire. 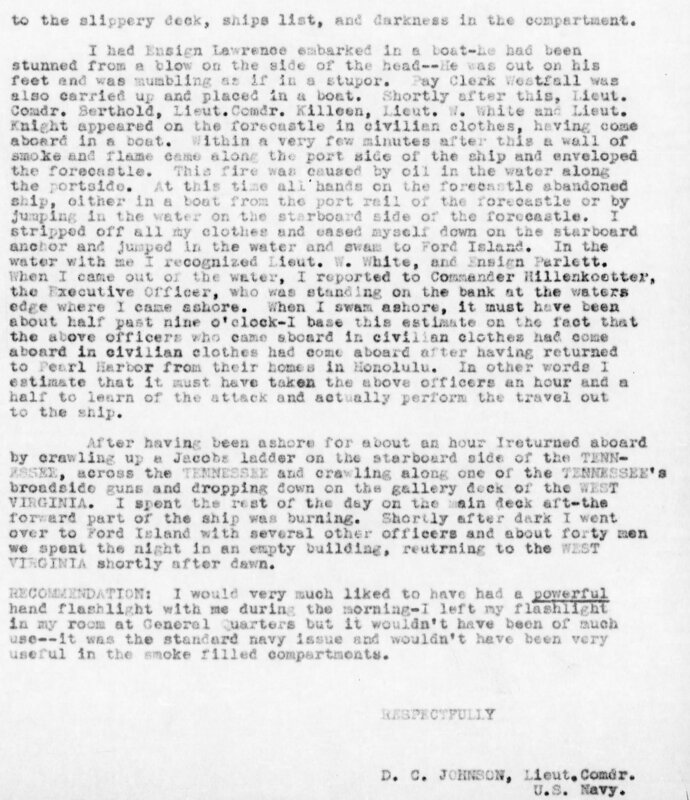 He refused to be evacuated from his post until after his men who had been wounded by the same shell were evacuated, and directed the reorganization of his command post until forcibly removed. As a result of his utter disregard of his own condition he died from loss of blood. 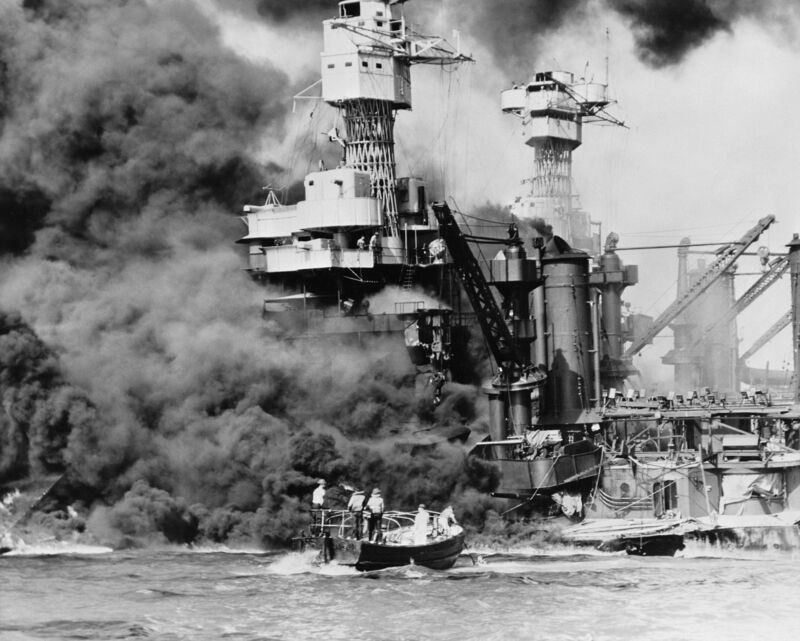 If you would like to add a story of a Pearl Harbor survivor or a “where you were” on 7 December 1941, please leave us a comment. 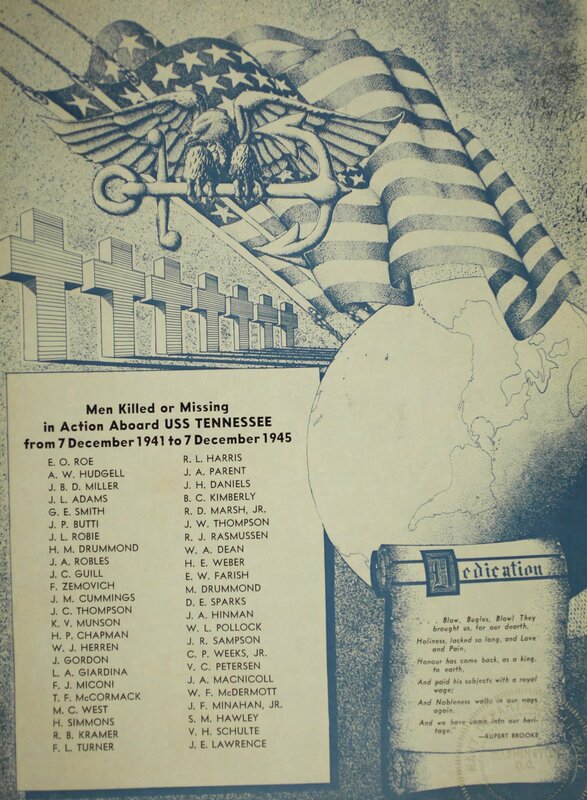 “The Attack at Pearl Harbor,” Pearl Harbor Survivors Online, Pearl Harbor Survivors Association, http://www.pearlharborsurvivorsonline.org/, accessed 6 December 2018. Gilbert Meyer interview, USS Utah Reunion, Palace Station Hotel, Las Vegas, NV., May 14, 2015, https://www.youtube.com/watch?v=pZPzirLSllg, accessed 6 December 2018. 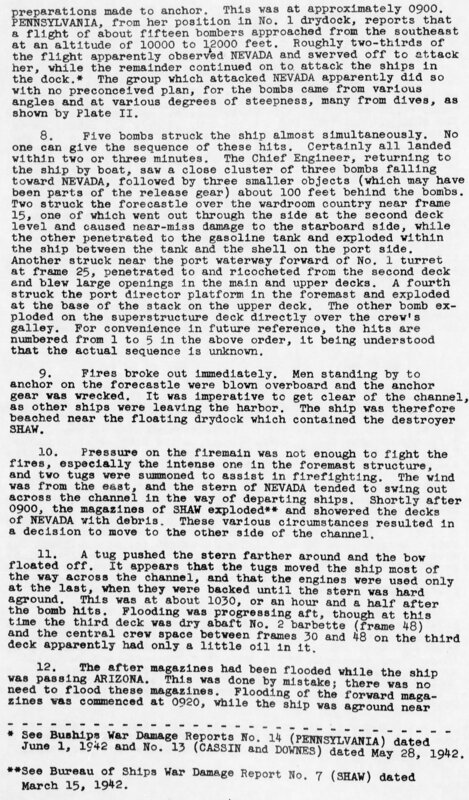 Ray Kuhlow interview, National Museum of the Pacific War, Fredericksburg, TX., 2001, http://digitalarchive.pacificwarmuseum.org/cdm/compoundobject/collection/p16769coll1/id/7257/rec/5, accessed 6 December 2018. Donald J. Stratton, The National WWII Museum Oral History, New Orleans, LA., 6 January 2011, https://www.youtube.com/watch?v=ANbWaKLYw1Y, accessed 6 December 2018. Thomas Butler interview, Oral History Collection, Wisconsin Veterans Museum, https://wisvetsmuseum.pastperfectonline.com/archive/621D4E64-164C-4AFF-925C-834425331540, accessed 8 December 2018. John Latko interview, USS Arizona Memorial, National Park Service, interviewer John Martini, https://www.nps.gov/valr/learn/historyculture/upload/JohnLatko.pdf, accessed 8 December 2018. Latko interview, National Park Service. 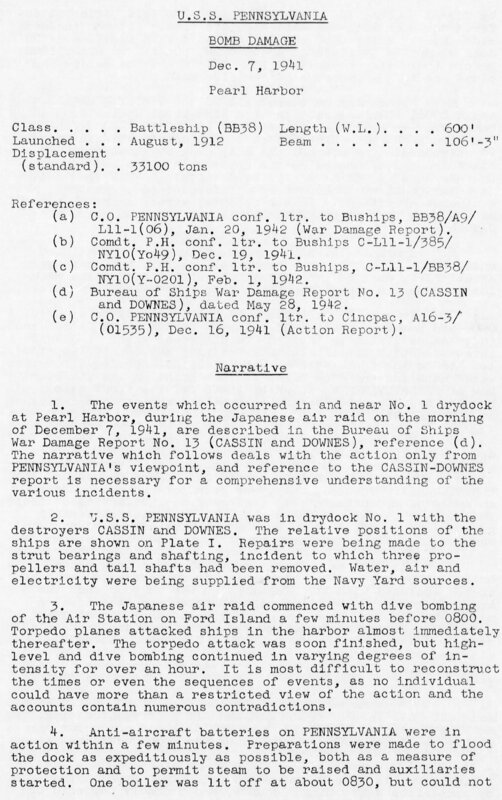 A. John Hausladen interview, National Museum of the Pacific War, interviewer Richard Misenhimer, 11 March 2003, http://digitalarchive.pacificwarmuseum.org/cdm/ref/collection/p16769coll1/id/5231, accessed 8 December 2018. Joseph C. Spitler interview, East Carolina Manuscript Collection, https://digital.lib.ecu.edu/text/10958, accessed 8 December 2018. ← Previous Previous post: The Veterans of WWII from Bell County, Texas (A Pictorial History).